Brecht Hated Opera: So Why Write Threepenny? 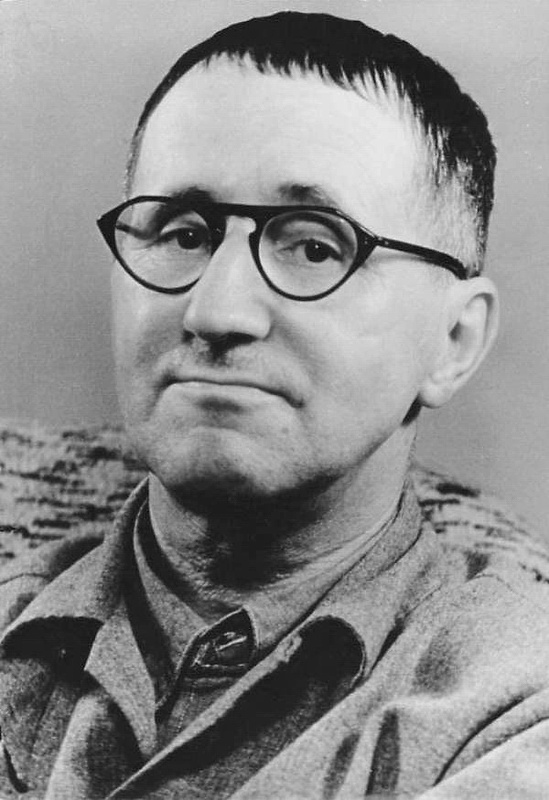 "Brecht hated opera”—a bit simplistic and overstated, granted, but perhaps not entirely inappropriate for dealing with the polemical, articulate, and highly opinionated mind and beliefs of this protean playwright, poet, composer, director, actor, producer, designer, performer, and theoretician. 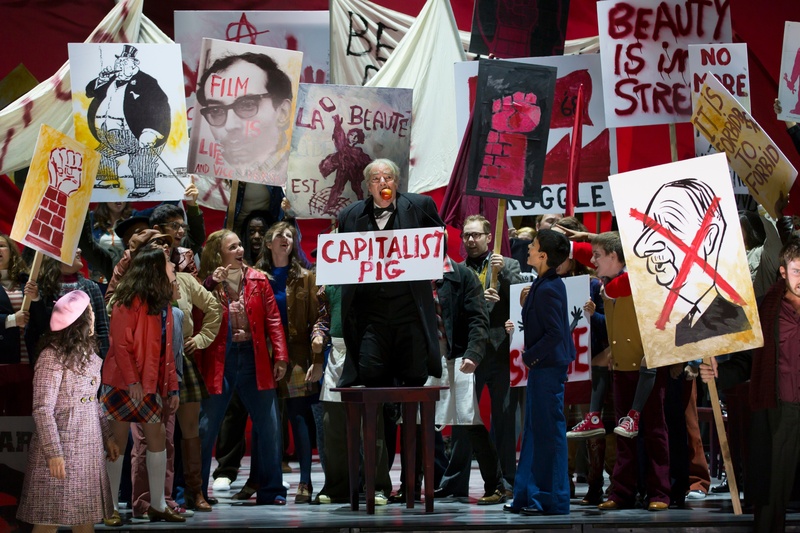 Certainly Brecht despised opera productions and audiences of his day as the complacent, corrupt, corrupting, and falsely “artistic” manifestation of an elitist, greedy, capitalistic society. He wrote, “We see entire rows of human beings transported into a peculiar state of intoxication, wholly passive, self-absorbed, and according to all appearances, doped.” But upon further examination, the situation becomes more ambiguous. (At this point, let me acknowledge my reliance for much of this material—here so briefly touched—on Joy H. Calico’s excellent, detailed, and very stimulating book, Brecht at the Opera.) Indeed, as Calico points out, “opera’s continued presence is one of the few constants in a life marked primarily by upheaval and flux.” And Brecht’s contentious engagement with Wagner’s theories on theater and opera—he railed against the composer’s baleful, narcotic use of “endless melody” and unresolved chromatic harmony (and the hiding of the mechanics of musical production with the covered orchestra pit) in order to seduce an audience into total submission—shaped Brecht’s own development of his ideas on Epic Theater and the desired active role of the spectator in the performance event. collaborations with Aaron Copland and Carl Orff, and (perhaps most intriguingly) a film version of The Tales of Hoffman pitched to Hollywood director Lewis Milestone in 1947. 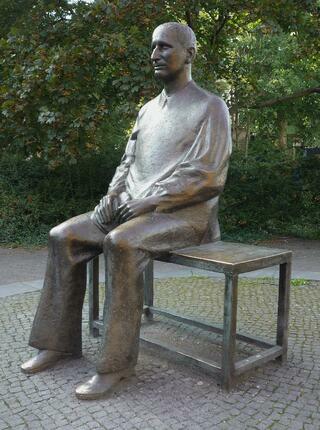 In the final year of his life, Brecht discussed with Dessau an opera about Albert Einstein. And most certainly, music, particularly song, played a crucial role is all his dramatic work from the beginning. stimulating, evocative, and, yes, pleasure-giving (on a deeper level) than they might appear. As we have said, Brecht railed against the narcotic effect of Wagner’s music, but also against the apparent “realism” engendered by the imposition of the wellknown “fourth wall” between the audience and the world onstage by playwrights such as Ibsen. Brecht wanted to renew the power of the spectator…to give him back the reality of his own imagination, to take away the visual and psychological elements created by the dangerously soothing illusions of theater, to “clear the underbrush.” The spectator should always be made aware of and should always recognize the basic superficial falseness of a production, should always see the lights and the mechanics, and the actor acting… it is the task of the theater-makers to make the familiar “strange” in order for the spectator to see into its essence. In the Epic Theatre, then, actors play multiple roles; they break the fourth wall to address the audience directly; placards indicate scenes or locations; equipment is placed in full view of the audience; and so on. Brechtian alienation becomes not something that pushes the audience member away; instead, the spectator is actively engaged, charged with evaluating and understanding the work and its implications for the “real” world outside the theatre walls—rather than allowed to lose oneself in a sea of music and emotion that (Brecht believed) lessened any possibility for action or change. In two recent productions at Boston Lyric Opera, the director Rosetta Cucchi and I drew, in part consciously, upon the stimulating and challenging spirit of Brecht. We were dealing with the formidable task of presenting two extremely familiar, deeply cherished works—La Bohème in the 2015/16 Season and The Marriage of Figaro in 2016/17. We felt that it was appropriate (and perhaps necessary) at this point to attempt to look at the works in a different context…to, in a sense, “de-sacramentalize” them… to perhaps allow audiences (and members of the production team and cast) to experience them anew. We therefore carefully chose to set Bohème amidst the youthful upheaval of the student riots of 1968 Paris, drawing on images and techniques from New Wave filmmakers Jean-Luc Godard and François Truffaut (themselves strongly influenced by Brecht). Added to and set against the late 19th-century aural world of Puccini, we introduced the sounds of news broadcasts, political orations, police sirens, and students chanting at violent demonstrations, highlighting rather than erasing that world. We employed title signs and quotations to deliberately fragment and de-familiarize the theatrical experience. Images (from top to bottom): Bertolt Brecht, 1954, German Federal Archive; Memorial of Brecht near the Theater am Schiffbauerdamm, sculptor Fritz Cremer, 1988; Revolution foments on the streets of 1960s Paris in Director Rosetta Cucchi's setting of La Bohème for BLO, October of 2015. T. Charles Erickson, photographer.